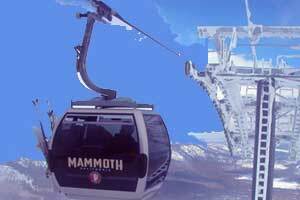 Up, up and away, my beautiful Mammoth Panorama Gondola ride. The kids think its like a very familiar skyway basket ride, you'll think this is the coolest scenic ride around. The gondola climbs up Mammoth's Summit to 11,053-ft. from the bottom at the Mammoth Mountain ski resort main lodge via a six-person gondola. The Mammoth gondola stops mid-mountain at McCoy Station before going on it's second leg up to the summit. At the Summit you will find the new Interpretive Center, a small cafe, and Views of the surrounding mountain ranges, lakes and the dramatic peaks of the Minarets. Enjoy the best view of the eastern sierra region unless you like helicopters! In winter, skiers ride the Panorama Gondola "to the top" to take several black diamond runs such as "Climax", "Dave's Run", or "Corniche." You can also take an intermediate catwalk called "Roadrunner" but you really do need to be a strong skier, this is not a place for parents dragging their kids. It is advanced only terrain. It is often 10-20 degrees cooler at the summit. You can make a nice lunch stop halfway at McCoy Station and sit outside and sip cocktails at "Steeps", or go inside to the food court for your lunch. "Parallax" restaurant recently opened and it is fine dining on the hill. In Summer, mountain bikers go all the way to the top and glide down over Mammoth's jaggy terrain. Riders are welcome at any time during any season, but you will need a ticket to climb on which can be purchased on the day you go at Main Lodge. It really is worth it. On a clear day you can see the Minarets, the pointy peaks off to the west, Yosemite just beyond the last mountain range to the west, and the Inyo Craters, and the White Mountains on the way down to the east. BRING A CAMERA!